This homemade costume for girls entered our 2014 Halloween Costume Contest. In the picture provided, I am wearing a homemade Mike Wazowski costume made by my mother. 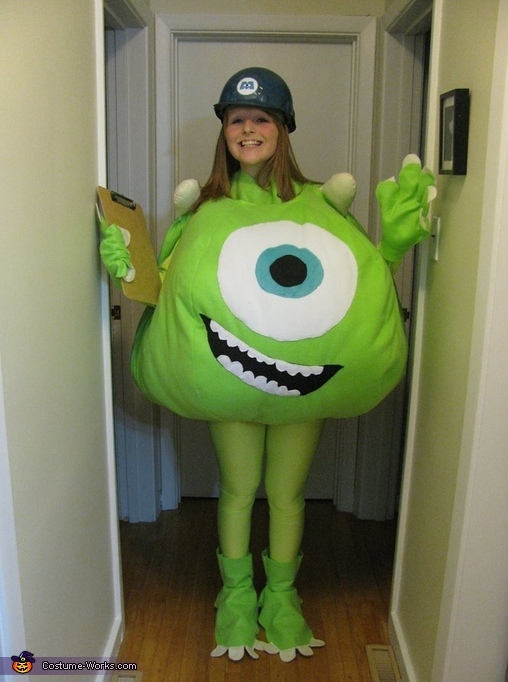 Inspired by the 2001 hit movie, Monsters Inc. Mike has always been my favourite cartoon character - so why not dress up like him for Halloween?! My mother enjoyed making this requested costume for me - as it was a fun project for her. It is filled with the insides of seven pillows. We had troubles finding the right colour leggings, but we finally stumbled upon the perfect ones online. I never thought I would find a blue hard hat, until I asked my uncle (a sheet metal worker) if he knew where I could find one, and he just so happened to have one himself! Overall, this is by far my best costume yet. I am so happy with how it turned out! Love the costume! Would like to see more of it or know how it was made. This gave me a great idea for our family costumes next year. how did you create it step by step?